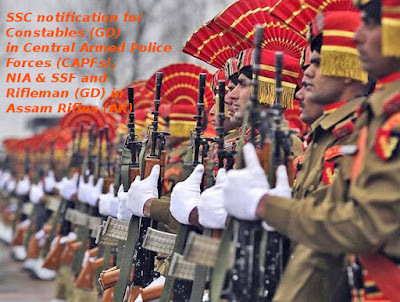 SSC Notification - Selection of Police constables 2018 ( General Duty ) for Central Armed Police Forces (CAPF) - 54593 vacancies - Qualification Tenth Passed - Last date Sept 17, 2018 - Men & Women can apply. This is a large recruitment and great opportunity for candidates who have passed Tenth standard. Selected candidates will be enrolled to serve in various Central Armed Police Forces (CAPF) divisons like National Security Guard (NSG), Assam Rifles (AR), Sashastra Seema Bal (SSB), Border Security Force (BSF), Central Reserve Police Force (CRPF), Indo-Tibetan Border Police (ITBP) and Central Industrial Security Force (CISF). candidates must apply online through the website http://www.ssconline.nic.in. or 'Click here to apply' link provided at http://www.ssc.nic.in - >Apply - >'GD - Constable'. Last date for the submission of online application for SSC Police constables recruitment is September 17, 2018. Please read the notification carefully and share with you friends.